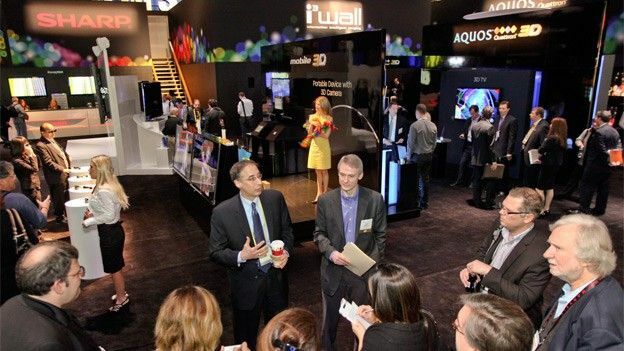 CES (Consumer Electronics Show) 2012 has got the rumour mill in overdrive, but what can we expect to see in the showroom at Las Vegas this year? The Consumer Electronics Show hasn't yet failed to provide at least a few huge announcements and with Nokia planning on being the company of 2012 surely we can expect to see some huge product launches. Taking on the likes of Microsoft Surface the EXOdesk is a 40inch touchscreen display that doubles as the surface for a desk, this is then connected to a desktop or PC and becomes a fully interactive workspace. EXOPC has already made one prototype and hopes to produce two models, one with its own CPU and GPU to give it premium performance handling lots of tasks while the basic model would just have a GPU and then connect to a desktop PC or laptop. How likely? Well there's been no official confirmation, but with a product as impressive as this it would be a crying shame not to have tech journalists getting their grubby hands all over it. Emerging through the mist of confusion comes an update to the story thanks to Industry expert Michael Pachter who believes that in fact we won't see a new Xbox until 2014. His reasoning behind this is that the 360 is still selling incredibly well and so believes that if we do see a new product at CES it'll almost certainly be a new model to be added to the current 360 range. This of course directly contradicts several 'insider' blogs which have started posting what they claim to be legitimate information that says the next generation of the Xbox will get it's debut at CES 2012. According to the source the focus will be very much on creating a seamless experience between all Windows devices, which means integration with Windows Phone 7 and Windows 8 as standard. It'll also be smaller, cheaper to produce and more powerful than the Xbox 360. There has also been talk of the next-generation Xbox coming bundled with Kinect 2, the next stage in the Kinect series of products. Reported by Eurogamer this rather scant piece of information suggests that the next Kinect will be able to detect emotions and also read a persons lips, as rumours go it's far-fetched stuff, but worth adding to the mix. With Nintendo out to showcase the Nintendo Wii U in a big way this could mean that it's the Xbox that has to prove itself rather than Nintendo having to catch up with Microsoft and Sony. How likely? While it would be great to see a new generation of Xbox the 360 is indeed still very successfull and so a lighter, and cheaper 360 certainly fits the bill. To be really sure though we'll just have to wait until CES to find out. Nokia to launch Windows 8 tablet? Yes, you heard right, there has been a rumour that while Nokia plans to showcase its new smartphone portfolio at MWC, Las Vegas is where Nokia really plans on stealing the show. Top of the rumour mill are reports that Nokia will be unveiling not only their first tablet but also one of the first Windows 8 products. No word on specs yet but what we do know is that even if this doesn't happen we'll almost certainly see a American Nokia Windows Phone 7 handset after it was confirmed the Nokia Lumia range wouldn't be heading stateside. How likely? Considering this is mere hearsay it's very likely that this is just fans voicing what they'd like to see rather than going on leaked information, that said, it certainly sounds like a show stealer. Again, very much a rumour and with no confirmation but there has been talk that Intel is working with HTC to produce their first handset. The rumour first came into life after it was reported that Intel employees were seen walking around a tech conference with Intel smartphone prototypes made by HTC. This could be the smartphone that Intel let slip about earlier in the year when they leaked that they could be putting Windows Phone 8 on smartphones, however this is just speculation. How likely? With the leak of the HTC Edge running Nvidia's Tegra 3 processor this is fairly unlikely, the only way this could appear is if HTC is targeting the US market through Intel. Nintendo is to follow an underwhelming E3 Wii U unveiling with another showcase of the next-gen console and yet again it is set to disappoint. "Nintendo of America, working with the 2012 International CES management, will offer demos of the upcoming Wii U console to members of the media who did not see the system at the 2011 E3 Expo," an official statement from Nintendo read. Xbox One review: is the original Xbox One worth your money? The new Xbox One Experience is now live and rolling out to consoles around the world, but what's it bringing to the table? The new Xbox dashboard is rolling out right now...here’s how to get it.